Adam McKay did it and it worked, but Jay Roach has failed miserably. Both directors attempted to come from a comedy background, take on a true story, and win some Oscars, and while these are lofty goals, the former seems poised to achieve them, at least partially, while the latter doesn’t even come close. To be fair, Bryan Cranston is nominated for a Best Actor Academy Award, but that’s seen by & large to be more of a gesture than a serious consideration, a nod but not an actual shot. And rightly so, since he and this film are nowhere near Oscar-caliber. 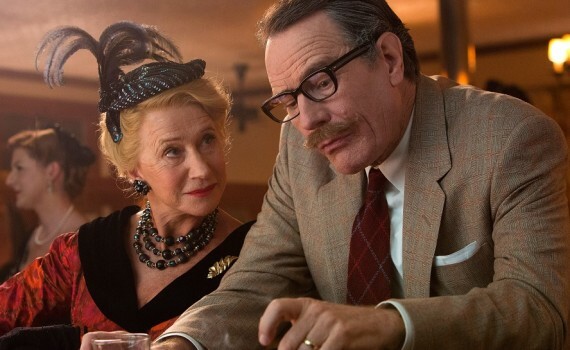 While McKay successfully (and surprisingly) transitioned from Step Brothers to The Big Short, Roach could not do the same from Meet the Fockers to Trumbo, which shouldn’t really be a huge shocker. This is the true story of Dalton Trumbo, one of old Hollywood’s most influential writers. As a member of the Communist party, Trumbo was at first simply an eccentric, a wealthy supporter of unions, one of many Hollywood screenwriters who helped workers get equal pay. But the Cold War and a shift in American politics shed bad light on the Communist party, making any American supporter an instant suspected spy. Questioned by a Congressional spearheading group and asked to give up the names of his “comrades in arms”, Trumbo choose silence, ultimately earning to trip to prison for his failure to discuss his political views. Blacklisted and shunned in a town where he was once king, Trumbo was forced to go underground, to write in secret, to allow others to put their names on his scripts, and somehow still produced some of the greatest screenplays in cinematic history. Apart from Michael Stuhlbarg, who I’ve actually begun to really enjoy (Cut Bank, Pawn Sacrifice, Steve Jobs), this is the one of the worst casts I have ever seen attempt to put a film together. It’s a frightening list of B-list celebrities who have proven time & again that they can’t act, or at least only come across as partially believable and/or likeable given the perfect role in the perfect film. Cranston who in no way deserves an Oscar nod, Lane who couldn’t convince me she’s an actual person let alone an old Hollywood Stepford wife, Helen Mirren who irritates me, David James Elliott from JAG, Alan Tudyk with the world’s worst accent, and Louis C.K. who has no business pretending that he knows what to do in front of a camera. Five minutes in and I knew I was in trouble, with some of the worst representations of humans I have ever seen, real or fictional. The only thing that saves this movie is the true story, and that just barely. Roman Holiday, The Brave One, Spartacus; these are only a few of the films Trumbo wrote while undercover, an impressive feat, especially given the circumstances. But that plot point is the only aspect this film has going for it, literally falling apart in every other facet.